Today’s article is brought to us by one of my favorites in the world of practical preparedness, Wendy Dewitt. I am posting her tutorial information on rocket stoves with her permission. Admittedly, I haven’t jumped on the rocket stove band wagon primarily because I really do have plenty of options already. I have the butane stove that I use with my pressure cooker. I have charcoals and a three-tiered Dutch oven cooking system. I have two solar ovens which I love to use. And I also have a Volcano Stove that has some similarities to the rocket stove. But having researched more on the rocket stove, I believe it does have merit for those of you who are just starting out or who would like some more alternatives. So here you go today, courtesy of Wendy. Thanks, Wendy! Using a can opener, open the #10 can and empty the contents, keeping the lid you cut off. Cut a hole the exact size of the soup can into the side of your #10 can near the bottom. (This is where the elbow will come out.) Make all of these holes as exact as you can. To make the elbow, take a soup can and cut off the top. Take a 2nd soup can and cut off the top and bottom. Carefully cut a hole in the side of the 1st can (at the bottom) and slip the 2nd can into the hole. Put your elbow inside the #10 can and bring the end of the elbow (2nd can) out of the hole you have cut into the side. To extend the elbow upwards, take a 3rd soup can, remove the top and bottom, cut it completely up the side and squeeze it together to fit it into the top of the 1st can. Adjust it so it comes to an inch from the top of the #10 can. Fill the can around the elbow with your insulation to about 2 inches from the top. Take the lid that you cut from the #10 can and cut a hole in the center just large enough for your soup can to come through. Push this lid over the soup can and onto the insulation. To make the “shelf” for your wood, take your 4th soup can and cut off the top and the bottom. Cut it up the side, flatten it out and cut it into a 3” x 3 3/4” piece. Shape this piece into a small "T", making the top of the T 3” wide and the bottom 2 ¼” inch wide so it can just fit inside your 2nd soup can. Making it into a “T” keeps the shelf from going all the way into the soup can. The small grate or rack goes on top of your #10 can to hold your pots or pans as you cook. To start your fire, push a small amount of paper under the shelf and place twigs on top of the shelf. Light the paper with a match. When the twigs start to burn, put your larger sticks on top of the twigs. Push them through as they burn and add more wood as necessary. 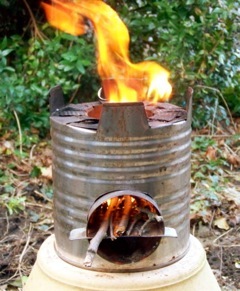 You may want to make a larger rocket stove or more than one so you can cook several things at once. 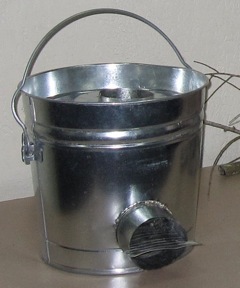 Unlimited ideas can be found online if you Google rocket stove. I built a stove similar to this one. It works well and directs a concentrated flame from very little wood. This stove would be good if I ran out of commercial fuel. In a pinch I could make wood last much longer than trying to cook over a traditional campfire. The tin can version will burn out pretty quickly if used a lot. There is a commercial model available that would last a long time, but it costs around $50. I'm definitely going to need pictures or drawings of the explanation for a rocket stove. I'm a visual person and the description isn't working for me. It sounds like a great concept. I have other options as well, but I'd like your opinion on the volcano stove. Is it worth the money? I have a propane stove and oven combo, a smoker/grill and a little hibachi grill already on hand. I'm thinking a solar oven would be a smarter purchase for me. I'd definitely go solar first. Thanks for the rocket stove info. What would be helpful is if you were able to include some drawings or photos of the steps as it easily could be mis constructed not fully visualizing your verbal steps. Wordpress is preventing us from uploading photos that we had with the article. As you may know in reading the rest of our info, we always load pictures as well. Just be patient. And, keep in mind that this is not an article written my Preparedness Pro, but someone else. Great info - thanks. This is a good idea for when conventional fuel sources run out; or to conserve them. I also have multiple options, but this is a good skill to know. Knowing how to make one and being able to teach others how to make one from food product containers they are consuming is worthwhile knowledge. I hope all have a great day! Well I'm investing in a good pressure canner this summer and then I'll go solar.